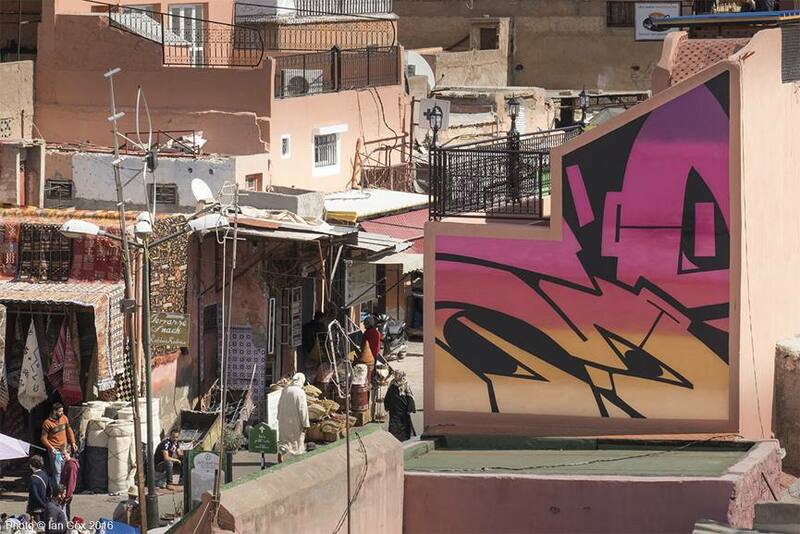 Marrakech Biennale, the event that gathers some of the best regional and international contemporary artists, this year got a special addition dedicated to street art. 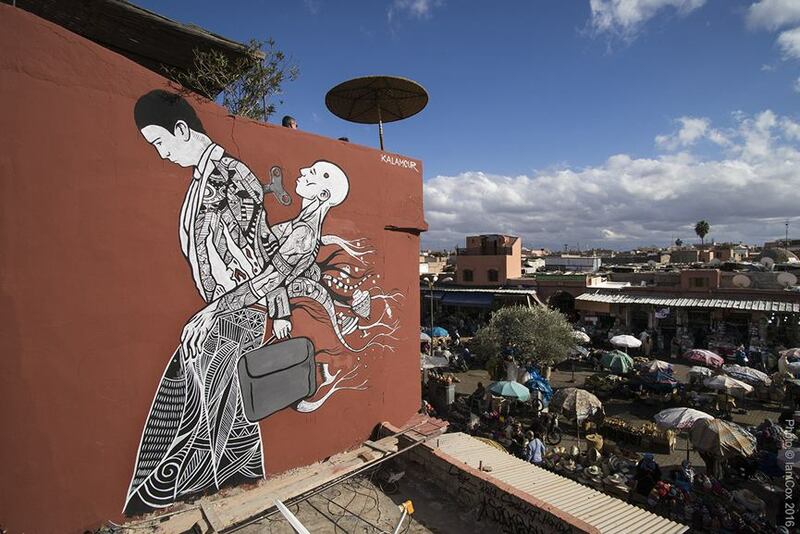 MB6: Street Art parallel project assembled some of the finest street artists in the world that will spend several weeks in Marrakech, painting on the walls of the Moroccan capital. This project is created and curated by Vestalia Chilton of ATTOLLO Art. 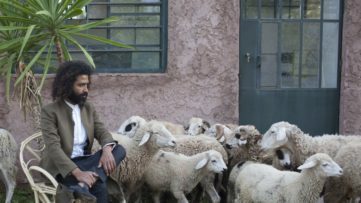 The widely acclaimed contemporary art curating firm from London brought MB6: Street Art as a partner project to the Biennale for the first time in history. 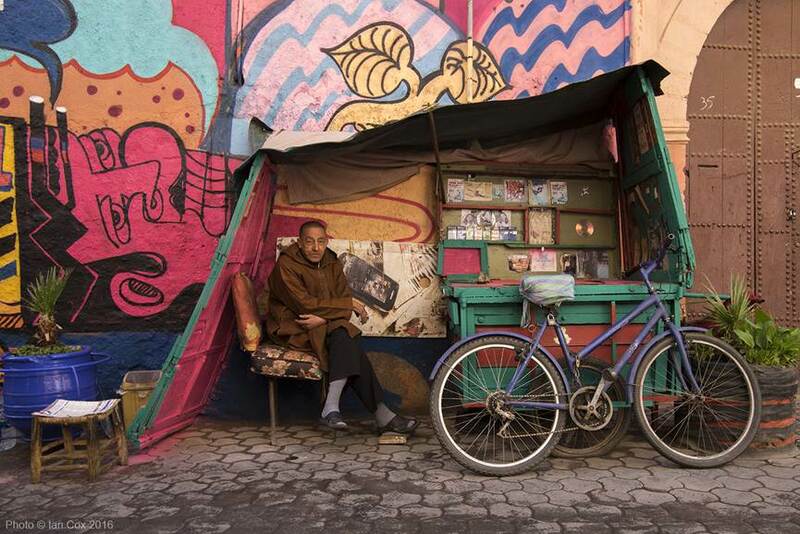 In a way, the project will be the continuation of the rich history of Moroccan highly detailed architectural tradition which numerous geometrical patterns and motifs represent a form of street art themselves. 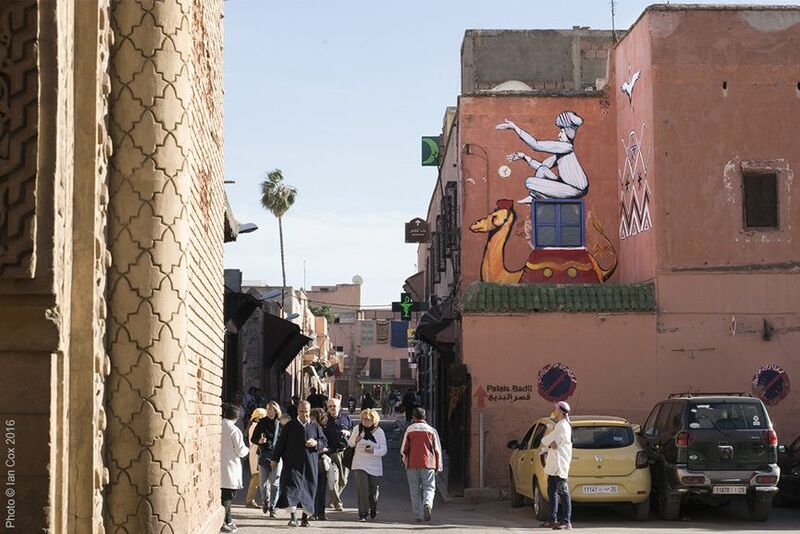 Many international creatives already arrived in the city and began the unique transformation of Marrakech. Eleven acclaimed street artists flooded the city with colorful, contemporary works that all explore a similar theme, the connection between traditional and modern culture. 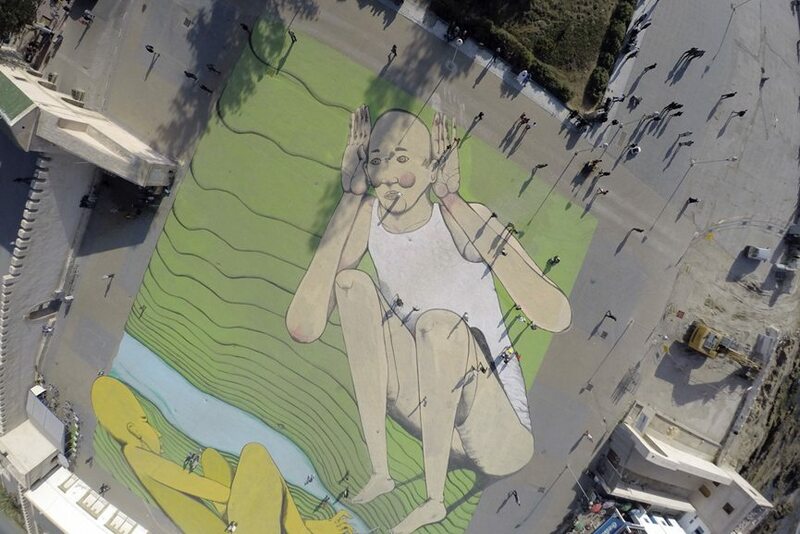 Earlier in February celebrated Italian street artist RUN has created 6400 square meter mural on the Moulay Hassan Square in Essouaira. 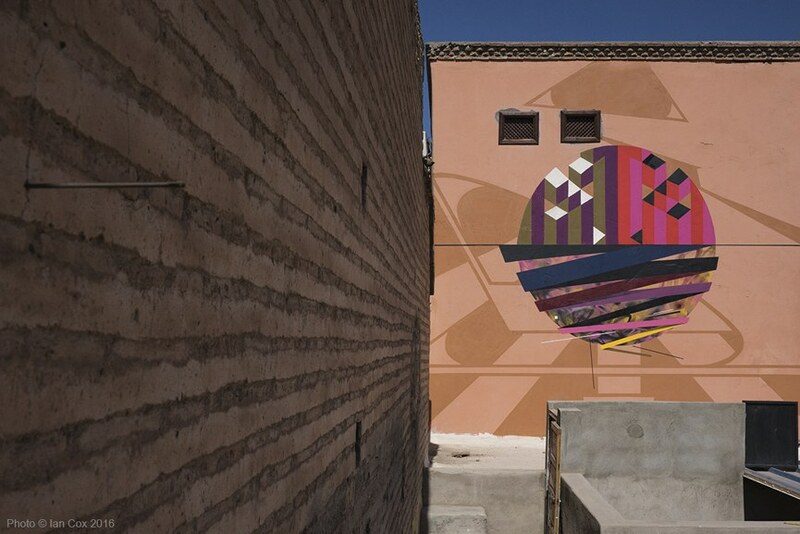 RUN depicted his trademark primitive characters and produced a piece that reflects on the history of Morocco. 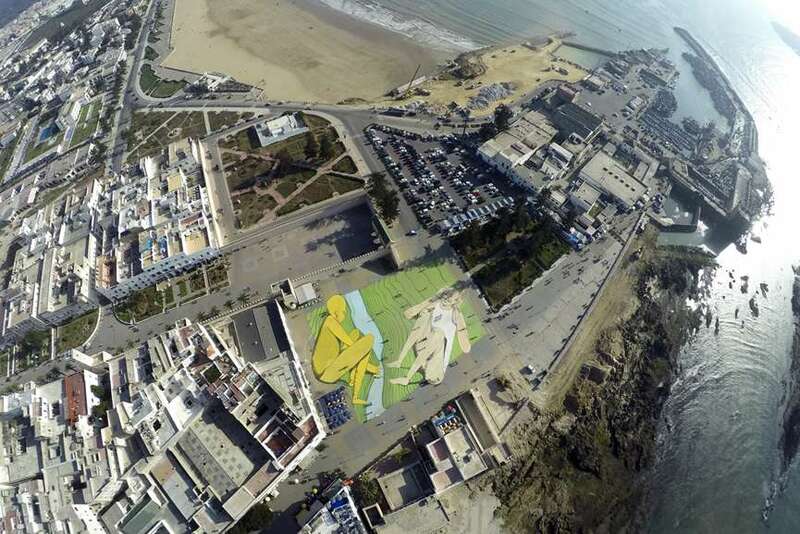 Image of two subjects that communicate both to each other and the surrounding neighborhood despite the border that separates them, represents the largest mural ever painted in North Africa. 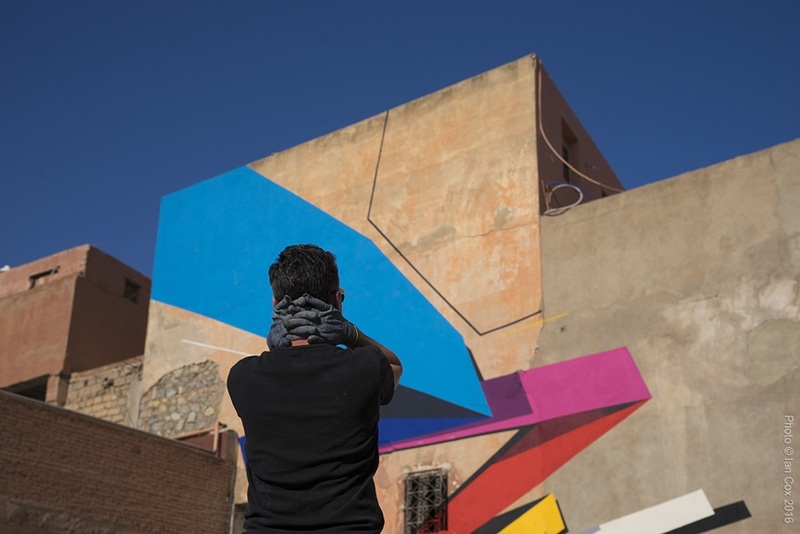 As a part of Marrakech Biennale’s parallel program, Dag Insky painted a mural on the terrace of Institut Francais Essaouira on February 23rd, 2016. Marrakech, the capital of Marocco is known for its salmon pink buildings that have earned it a nickname “Rose City” or “Red City“. The nickname of the city proved quite stimulating for many artists that used the expression as an inspiration for their works. Celebrated German artist and our artist of the year 2015 Mad C, honored the color palette and the tradition of the Rose City by painting a large blue and pink mural on the side of the building. 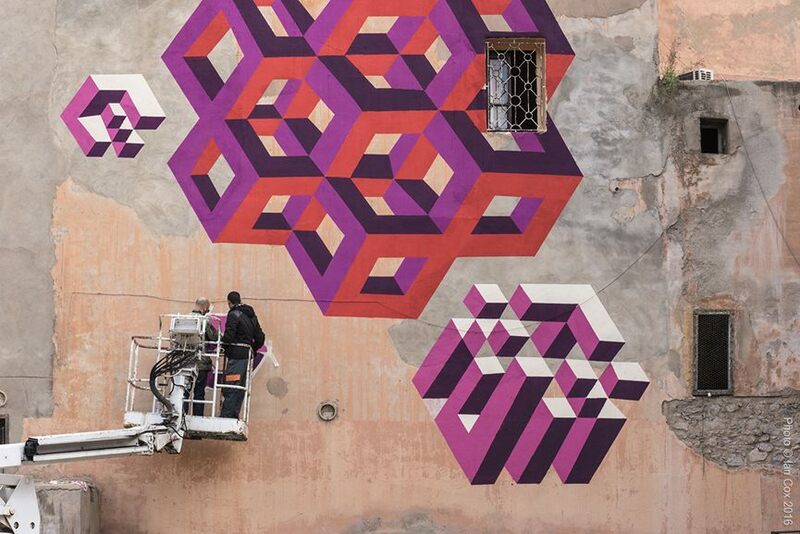 Another master of geometrical abstraction LX ONE used red and purple tones to embellish a large deteriorating wall in Marrakech. The artist known for playing with shapes, colors and materials created a mural that not only complements the warm tones of the local neighborhood but also incorporates surrounding elements such as intricate window bars into the image. 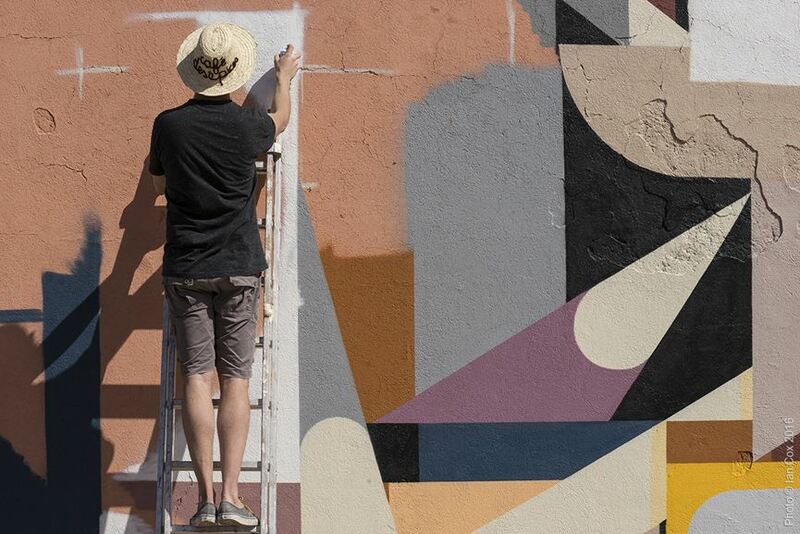 A vivid mural by Dotmaster also draws inspiration from the nickname of the city where it was created. 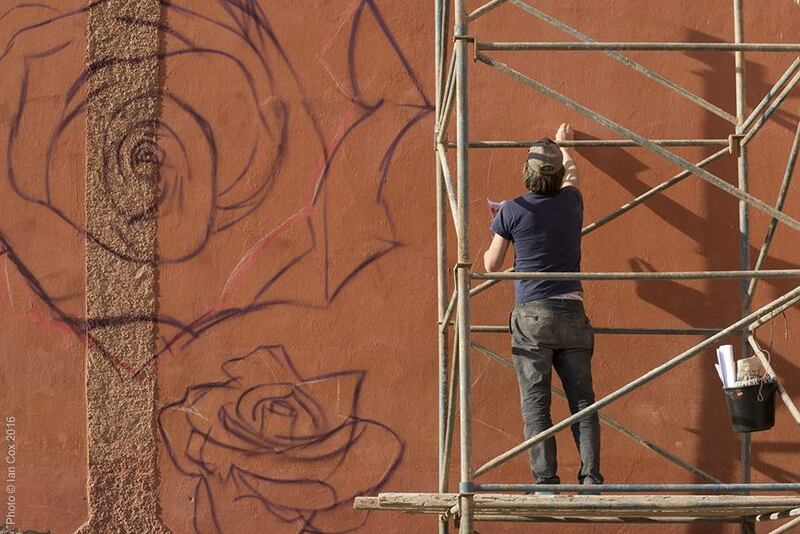 A mural composed of numerous roses in full blossom corresponds with the history of the Rose City. The residents of Marrakech may feel like they’ve walked into a fragrant bouquet while passing by this lifelike art piece. Bristol’s graffiti artist Sickboy also joined the event and created one of his largest artworks to date. The lengthy piece is marked with an array of bright colors and characters that interweave to create another humorous and positive mural that will undoubtedly make the locals smile every time they pass by it. 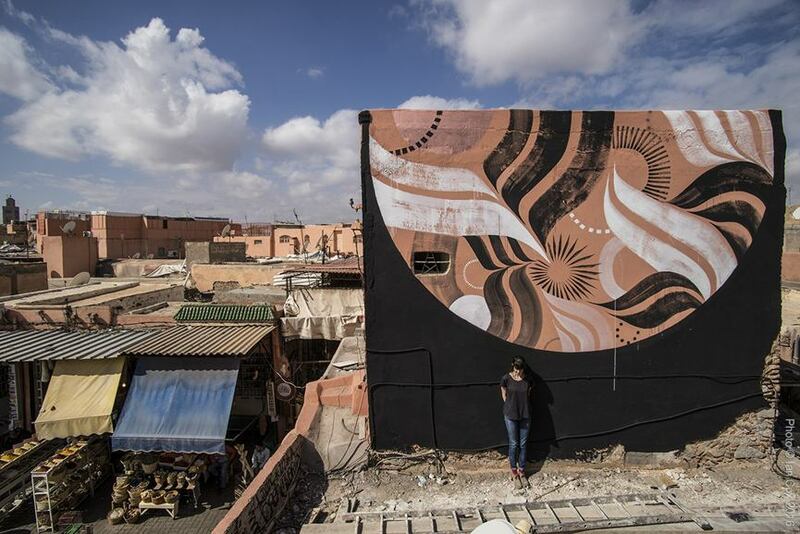 Lucy McLauchlan decided on darker tones while painting her giant mural in Medina. 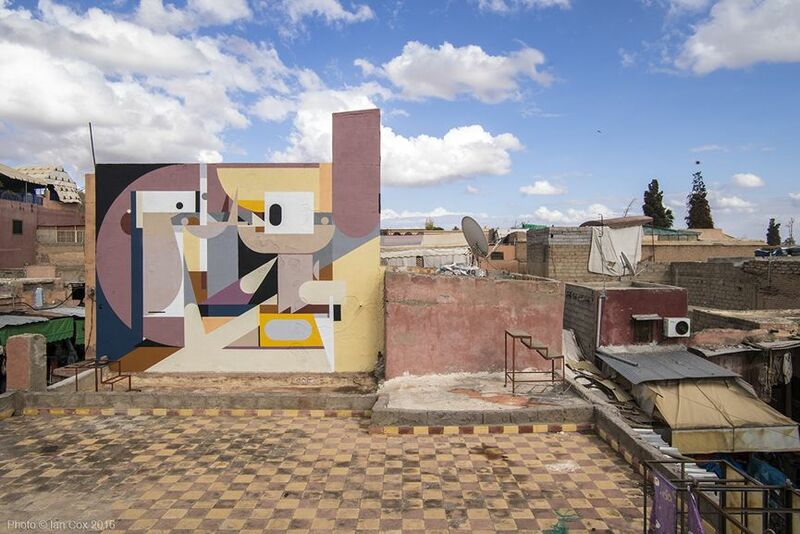 The artist climbed high up onto the fragile rooftops that skirt the Place des Épices within the Souks in Marrakech to produce a vibrant yet earthy mural located on the private home in the city of Medina. And opposite from this spheric piece by Lucy McLauchlan lays a much more sinister art vision by a local artist Kalamour. It appears that the businessman on the artwork was so preoccupied with taking care of his briefcase (which he holds so firmly in his hand) that he completely forgot about his soul that got lost on the way. 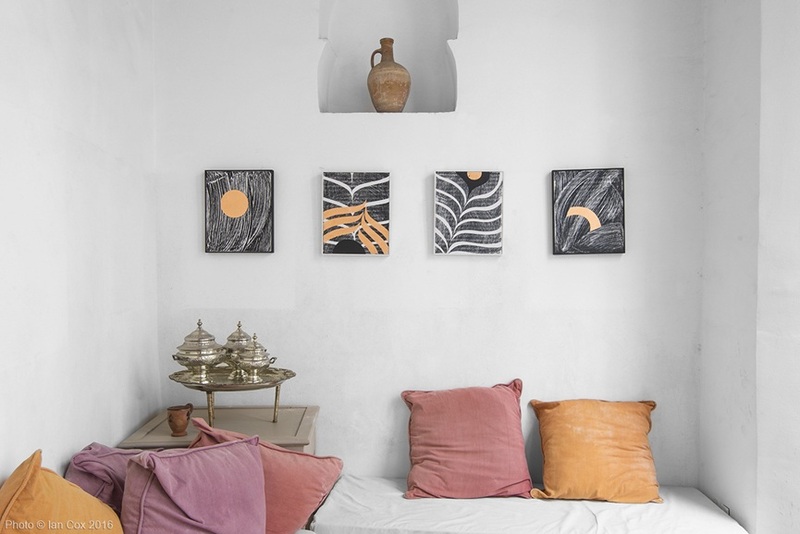 Intricate and lovable characters by Alexey Luka inhabited another deteriorating facade in Marrakesh. 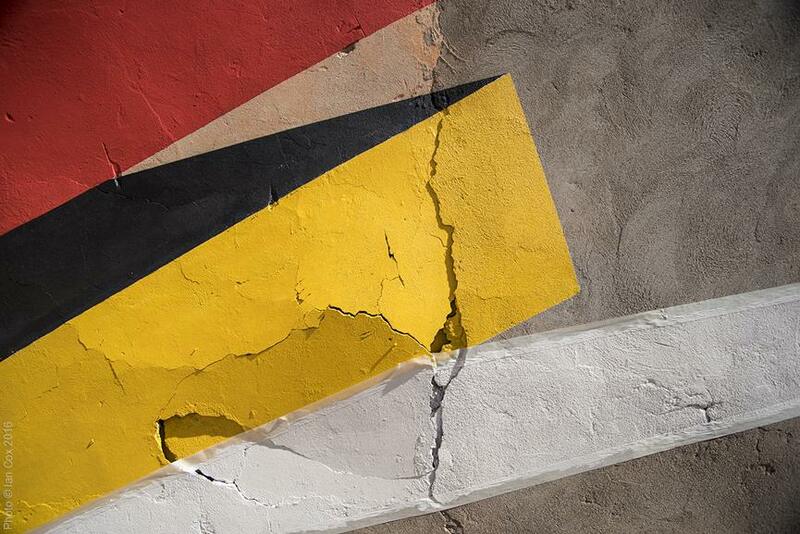 Human faces, hidden inside the geometrical forms force the viewers to use their imagination in order to discover the story beneath this colorful mural. Marrakech Biennale turned out to be a great opportunity for collaborations as several artists joined forces to create large-scale artworks. British artist Yesbee has done a striking collaborative mural with Remi Rough and LX ONE. 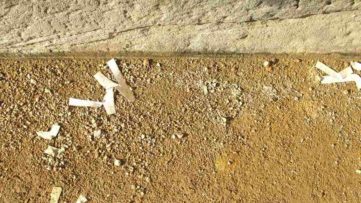 The artist known for creating numerous wild style graffiti, packed with edgy elements such as arrows and kicks also proved that great works can be made pretty much anywhere and used a smaller part of the rooftop at the local market to write his calligraphy message. 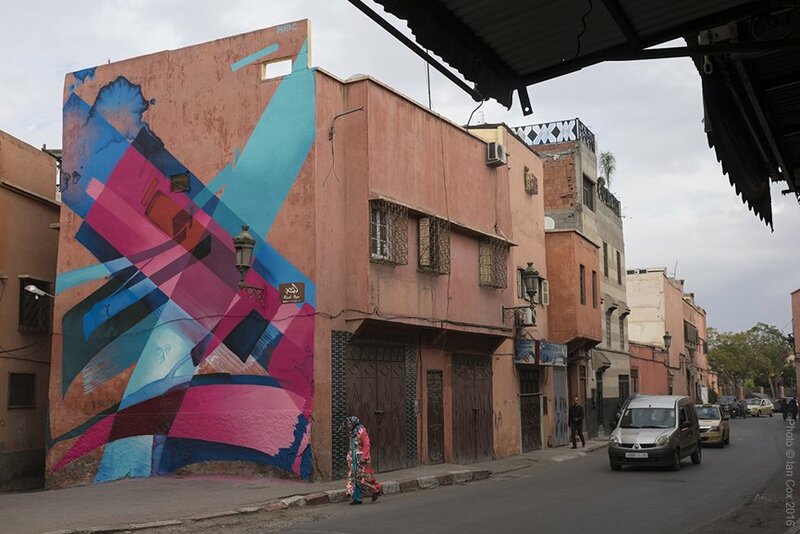 Graffiti artist Remi Rough was inspired by the colors and lights of Marrakech which he incorporated into an artwork that opens up a dialogue with the surrounding space. 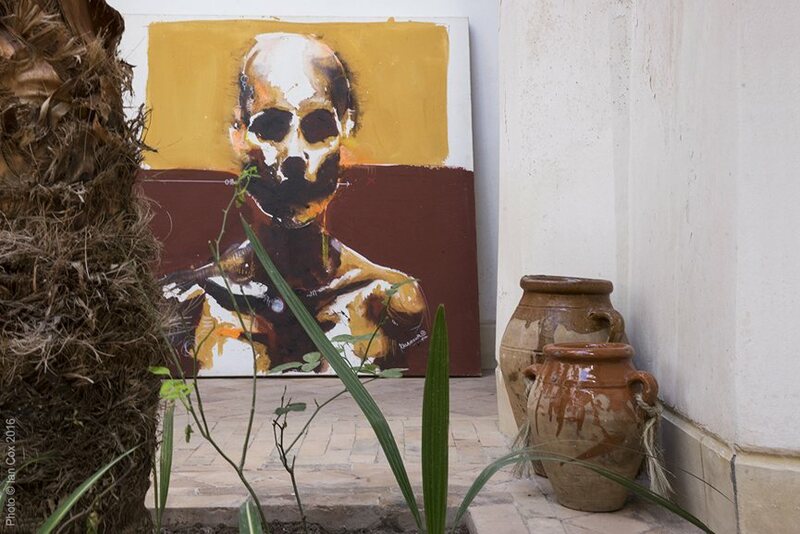 The prolific artist also produced several collaborative murals one of which is located in front of the noted Koutoubia Hotel in Marrakech. With so much work already done and so many artworks already made its hard to believe that there’s still more to come. But there is. 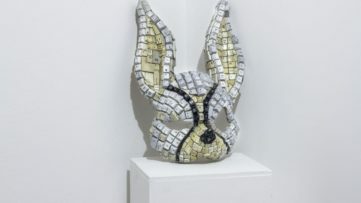 A group show of the participating artists’ fine art and paper works is currently on display at Street art Gallery in Marrakech and the organizers from ATTOLLO Art have prepared something special for the closing weekend (from May 6th till May 8th, 2016). For fine art lovers, this is just another edition of the event that brings the finest cutting-edge artists into the Moroccan capital. 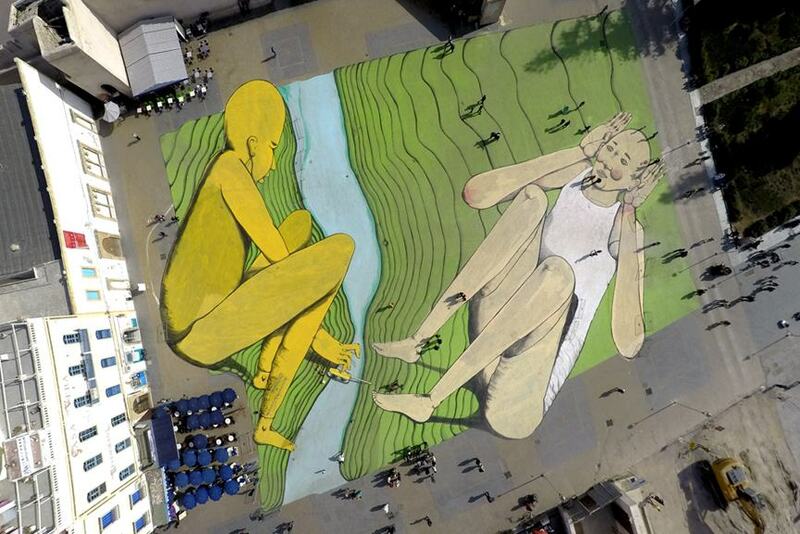 For street art enthusiasts the sixth edition of the Biennale is a little bit more than that. 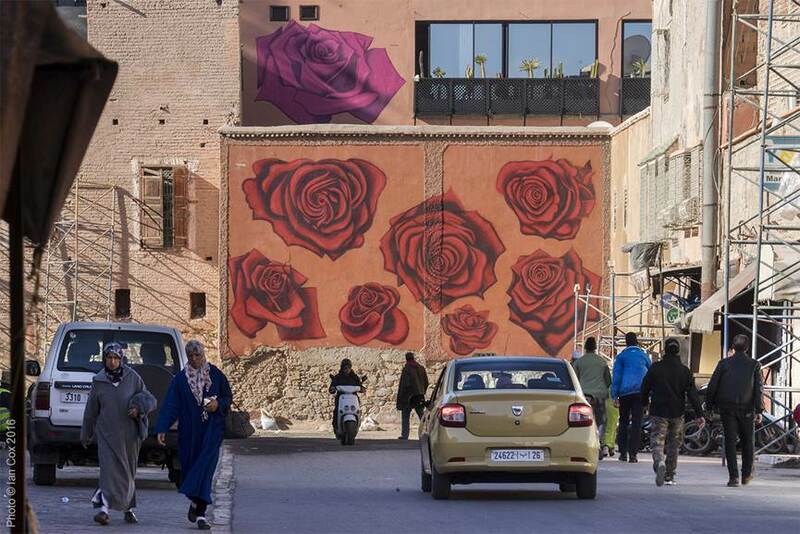 By incorporating MB6: Street Art project into the main event, Marrakech Biennale once again proved that street art can stand side by side with the works from any other art field. 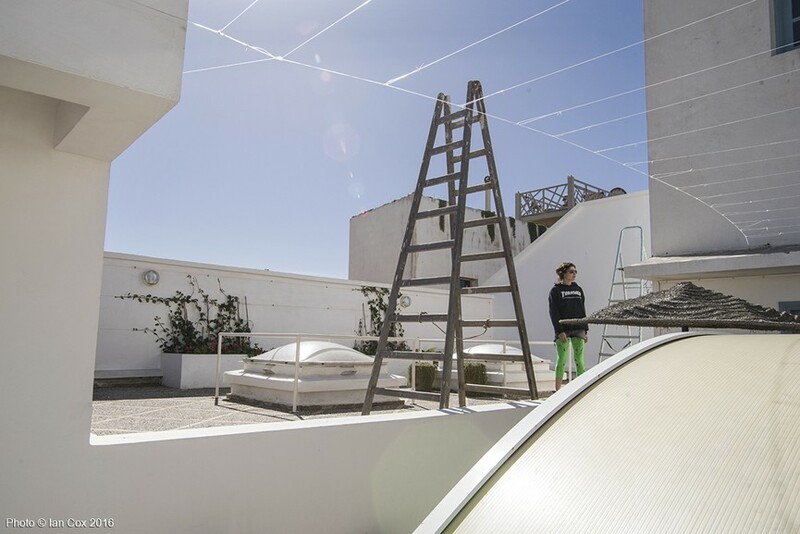 This year’s edition of Marrakech Biennale started on February 24th and it will last till May 8th, 2016.